The brand new co-working space stands with a strategic presence in the middle of Leipzig. There are multiple tram stations close by and S Bahn stations making it highly accessible on top of its quality amenities. These include stylish and modern designed private offices, coworking spaces, conference rooms of various sizes, a lounge area and an activity room where you can take a break and relax. The activity room is fully equipped with a kicker, ice-hockey table and Playstation; perfect for forward thinking companies that value worker/client satisfaction. These brand new contemporary offices are opening soon in the heart of Leipzig. The centre is due to offer a variety of working spaces including private offices, coworking spaces, conference rooms and you can take advantage of their prestigious business address using virtual office options. Work spaces come fully equipped with high quality fixtures, and a friendly on-site team are available to provide you with administrative support in day-to-day tasks. The location is highly central with reliable public transport links, and the neighbourhood offers a range of amenities. 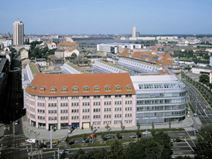 A selection of offices of various sizes is available to let in this superb building in the heart of Leipzig. Provided with meeting rooms, advanced communication systems and parking facilities, these modern offices benefit from an excellent location: close to the main railway station, well served by public transport and easily connected to numerous areas through the motorway. This is the perfect workspace solution for companies that value accessibility and practicality. This landmark building in Leipzig consists of a wide range of offices equipped to a high standard and provided with a full list of services and facilities, and features an elegant courtyard that is sure to impress visiting clients/executives. There is a secretarial team that will handle your telephone answering, and complementary beverages for your comfort and convenience. The space is accessible 24/7 so you can work through late hours, and is surrounded by many excellent restaurants, bars and retail stores. Located in a highly convenient and central location in the heart of Leipzig, this business centre offers innovative and modern coworking spaces. All spaces benefit from excellent amenities including high speed and reliable internet, refreshments, on-site showers and a fitness centre. An integration manager is on-hand to help you get settled and workspaces are fully equipped and ready to use so you can start working as soon as you move in. The centre benefits from excellent transport links with the train station right on your doorstep and trams running through the area frequently. Offering brand new office spaces in the city centre of Leipzig, this business space is opening soon. These contemporary and modern spaces offer bright and spacious work stations for professionals, freelancers and well established entrepreneurs. You can choose from a selection of bespoke packages to ensure you get exactly what you're looking for. Situated right in the heart of the city, the space is found in a brilliant location with plenty of local amenities and transport options. 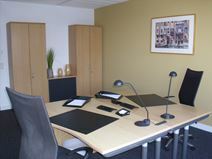 This business centre consists of a selection of offices of various size and large meeting rooms. These office spaces are provided with reception and telephone services, videoconferencing facilities and a full range of other services. Just off Leipzig, they are served by various tram routes. The picturesque Guia Turistico Dresden is just 10 minutes away from the space by foot; a destination that is sure to impress your visiting clients and executives.